Melbourne Product Designer Kain Lucas began his career in 1999 by establishing a furniture studio in his home town of Mount Macedon, producing custom made solid timber pieces for local clients. Kain studied Furniture Making at Victoria University and later went on to study Building Design at RMIT. During 2004, Kain lived and worked in London where he landed a job with fashion house Stella McCartney in her Mayfair press office and later worked for UK design guru Terence Conran in his flagship Conran Shop store in Chelsea. 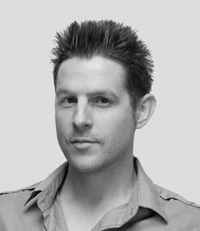 Upon his return to Melbourne, Kain started producing furniture pieces which were included in numerous design exhibitions in Melbourne and Sydney, and in 2007 was short listed for the prestigious IDEA awards. Realizing the increasing recognition of Australian design and the huge gap between designers and Australian manufacturers, Kain conceived the idea to create a manufacturing company specializing in the production of Australian designed home accessories and furniture. In the winter of 2007, Kain founded Ute Australian Design, offering what he describes as highly refined utilitarian products which are the result of a strong ethos to produce intelligently designed products that provide real solutions for real needs. Ute’s goal as a brand is to create Design that works™. To make a well designed object that possesses inherent beauty beyond the aesthetic, Ute affords each component equal status in its approach: the form of the object, the materials from which it is made and the method of manufacture. Perfecting the relationship between these three elements, their interplay and reliance upon one another, is the key to Ute’s success. Two short years after Ute’s inception, Kain Lucas has been short-listed for the prestigious Bombay Sapphire Design Award for his striking series of Victoria Tables.